Lightness, freshness, natural colors in combination with thoughtfulness and practicality - all this is a Mediterranean style in the interior that has so briskly gained popularity throughout the world. 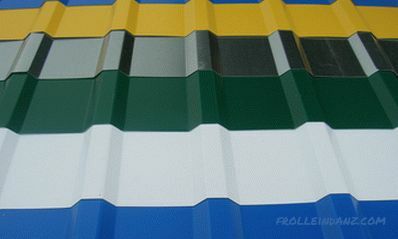 It is used for decoration of country houses and villas, apartments and even office premises. This style has earned this "nationwide" love justifiably: low financial costs, beauty and simplicity of arrangement made it accessible to the general population. style The Mediterranean style is literally saturated with brackish sea air, penetrated by warm sunshine and filled with fresh green foliage. 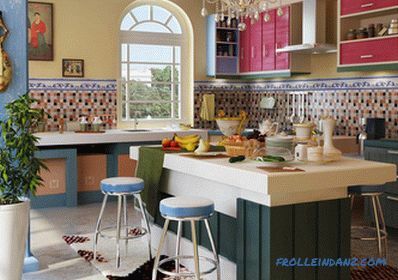 Greece and Spain, Algeria and Morocco, Turkey and the north of Egypt, France and Italy are so different, but at the same time similar in color and mood, the cultures became the territorial and historical "ancestor" of this wonderful trend in the interior. But the basic concepts of style is obliged to the Greek and Italian ideas of conciseness, simplicity, convenience. A room in a classic Greek style. Moroccan moods in the Mediterranean style. Italian vision of the Mediterranean manner. The key idea of ​​the Mediterranean interior design is lightness in everything. 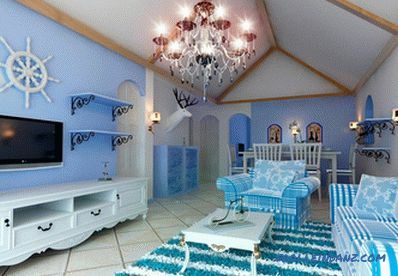 In this style there is no place for luxury, extravagant accessories, elaborate decor and ornate furniture. It is distinguished by well-thought-out details, functionality, simplicity and affordability, and this is similar to classic country music. All the natural gifts of the Mediterranean are reflected in the fresh colors, shapes, colors and ornaments, and the atmosphere of the style is imbued with romance and warm light. There are several directions in the Mediterranean style of the interior, which are similar to the abundance of the sun, natural materials and natural natural shades. But the main varieties that set the tone for all other options are considered to be the Greek and Italian manner of arrangement. The main colors of this trend are white, lemon yellow, emerald green and the whole spectrum blue and blue. 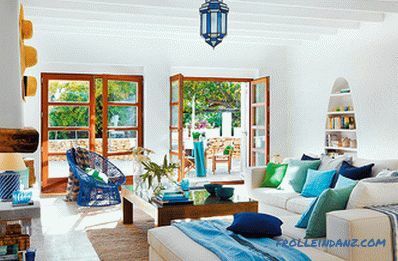 Although these colors are considered cool shades, the mood of the rooms is sunny and bright. The accents in the Greek, or, as it is also called, Cycladic style are the blue and white stripes and inlays of rich pink or red. It can be textiles and furniture, ceramics and glass, dishes and any other accessories. The combination of blue and white, reminds not only the boundless sea distance, but also the national pride of this country - the Greek flag. Another distinguishing feature of the Cycladic style is the alternation of shades. Even furniture from one headset can be painted in different colors, but it is located in a strict order. 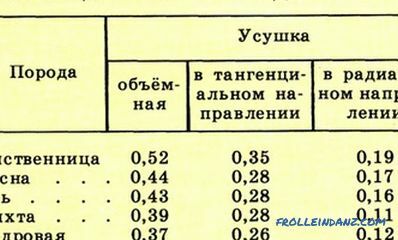 In general, consistency and accuracy are inherent in this style, although in the completed image there is not a hint of careful, even pedantic observance of any rules. Often in this Mediterranean-style interior there is a black color, but only as separate accessories: glass bottles on an open shelf or photo frames on a white wall. Such small, but precise accents even more refresh the room, put a kind of "point" in the design. In bathrooms, this style is usually limited to concise white-blue or greenish ceramic tiles and minimal, but bright decor. The ideas are the same: open space, freshness, floral ornaments and a lot of light. Red-pink flowers play the role of bright accents. Many pillows of different colors create a certain order. The classic version with black accents. 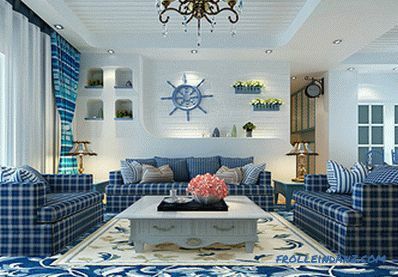 Decorative window and seascape are used as bright décor. Unlike the Greek "relative", this style has collected only warm, soft shades: bright yellow, orange, green, olive, all gradation of brown and golden . In combination with brickwork or imitation thereof, these tones create an incredibly cozy mood and make the room interesting. Handmade elements are used as accents in Italian Mediterranean design: mosaic and painting on walls or floors, deliberately created roughness and unevenness. Furniture for such a direction is chosen wrought or wooden, even massive, but comfortable. Often, several design options coexist in the same room: mosaic, drawings, bright floor tiles, and brick inserts. Contrary to the fear that such a combination will become a jumble of accents, the Italian Mediterranean style looks very advantageous and original. And the final touch to this style is large windows.Even in the bathroom there must be a window opening, letting air into the room and natural light, or its imitation. Incredibly soft tones of Italian style for the dining room. Mosaic floors and imitation masonry work together perfectly. 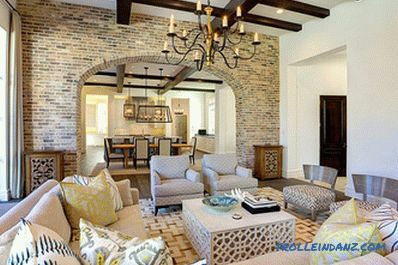 Mosaic elements, brickwork and decorative plaster in the same room. 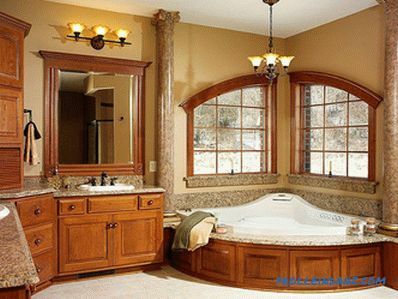 A classic Italian bathroom with windows. Mediterranean-style colors White and blue accents dominate the Greek design; in the Italian direction reign brick, dark green bottle and rich yellow tones. Allowed to insert other spectra, mostly in harmony with the basic background, but in the form of certain decorative elements. For example, ceramic vases, decorative plates or bottles, cushions or flower pots. The brown spectrum in the design of the Italian room. A white and blue classic gamma in Greek style. 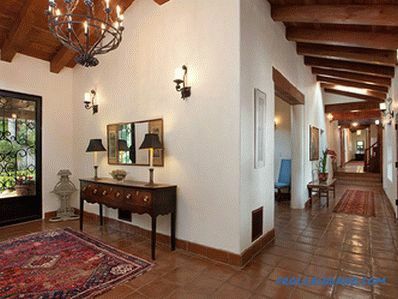 Greek interior design in the Mediterranean style is based, as a rule, on white walls. They, like a blank sheet in the artist's album, allow you to create unique ornaments of blue, blue and green inserts. 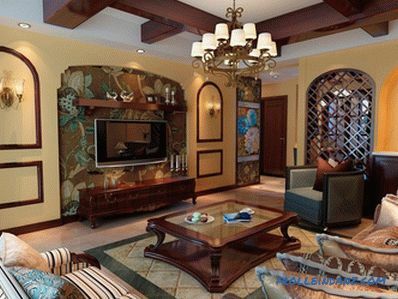 The material used for the decoration of the walls is decorative plaster or paint. Another feature of this trend is the use of wood panels. Usually they are painted with a special method in bright colors, which are very beneficial in harmony with the general background. It seems that these wooden canvases have been spent under the scorching Mediterranean sun for several years, absorbing the salt of the sea and the spirit of Greece. Matt, often with deliberate irregularities, walls are characteristic of the Italian direction. A popular way to finish - stukko. This is a variant of decorative plaster, in which there are small particles of marble, gypsum, lime and water. Roughly at first glance, the material looks just great, emphasizing the elements of furniture and decor. Another interesting way to finish the walls, typical of the Italian Mediterranean style, is to paint the surface with overlaying of several layers of shades from one spectrum. This design creates natural shadows and perfectly imitates the play of light, which gives the room even more charm and refinement. 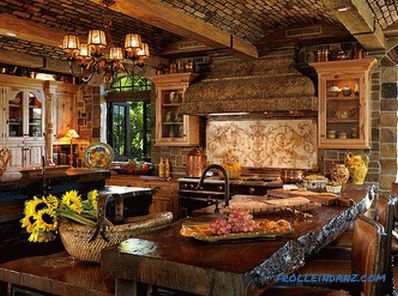 Union of mosaic and plaster in the design of the kitchen. Stucco is in perfect harmony with raw wood and linen textiles. 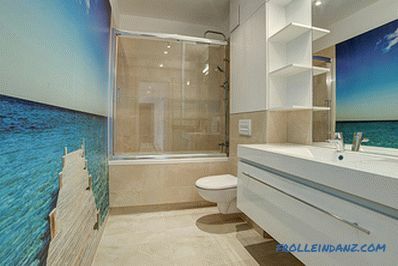 Wooden panels combined with painted walls. 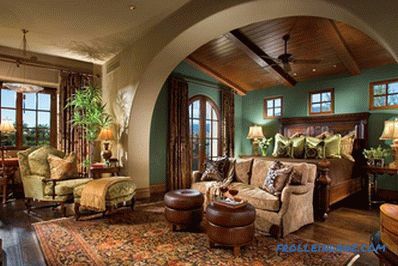 Like walls, Mediterranean-style ceilings are usually discreet, neat and simple. In the Greek direction, paint or plaster is usually used, and the color solutions remain unshakable: white-blue, blue and greenish tones. 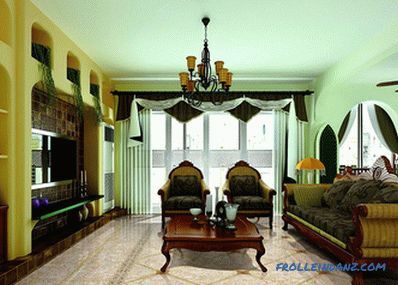 Italian style implies on the ceiling textured plaster of standard colors, necessarily echoing the walls. 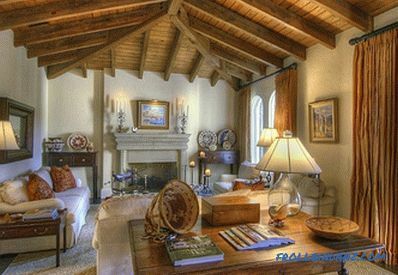 The key point in this design is wooden beams, which can simply be painted on stretch ceilings. Real logs are sometimes painted, but more often left in their original form. They not only serve as a peculiar element of the decor, but also help to raise the ceiling, visually making the walls higher and the room bigger. White wooden beamed ceilings in Greek design. 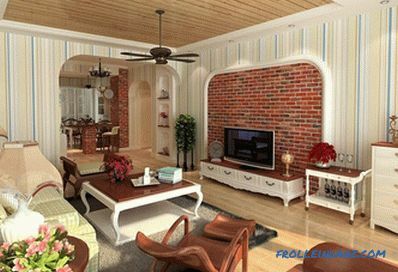 Stretch ceiling with imitation of wooden slats. The classic version of the design of ceilings in an Italian manner. 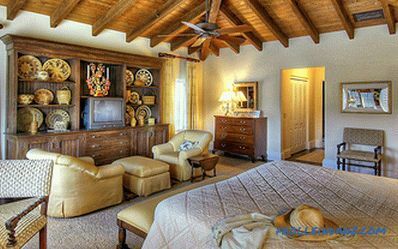 Unlike other areas that require adherence to certain canons in furniture design issues, the Mediterranean style is flexible. 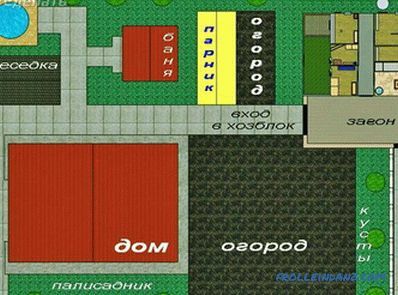 The main conditions are simplicity and functionality. Even massive cabinets and dressers should be easy to use and simple to design. Minimum ornate and unnecessary details - the dignity of furniture in this style. 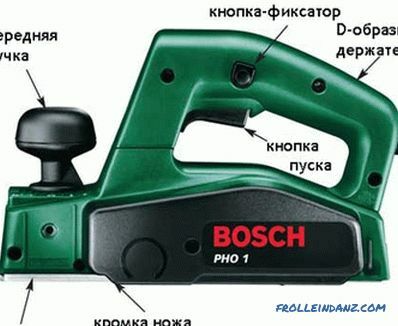 The main material for furniture is solid and durable wood - bog oak, spruce, pine. Each product is usually processed and assembled by hand. An indispensable furniture attribute of this style is wooden chests, which serve as an excellent container for things and support the "sea" spirit of the room. As for the color range of furniture, in addition to natural wood shades, traditional style shades are welcomed. And in the Italian version are often found forged products that fit perfectly into the overall Mediterranean surroundings. An elegant combination of wooden and leather furniture. A rough, untreated wood looks very appropriate in the Mediterranean interior. An interesting solution: a chest instead of a coffee table. As with furniture, textiles are not aesthetic, but practical. Therefore, the fabrics are selected mainly natural, and the color design remains concise. At the same time, there are much less textile accessories in the Mediterranean style than in the classics, empire or country. Basically, the fabric is found in the form of towels, tablecloths, bedding and bedspreads. As a rule, these products are either plain, light or decorated with plain ornaments in traditional shades. But vegetable motifs and geometric shapes are almost never found. As for curtains, it is preferable to use Italian or Roman curtains in this direction. But modern trends have brought to the Mediterranean design and the usual blinds, however, from woody species or bamboo. But the curtains in the usual form are extremely rare. Multi-caliber pillows are a great decoration. Traditional color palette of textiles in the Greek direction. Italian curtains in the Mediterranean style. 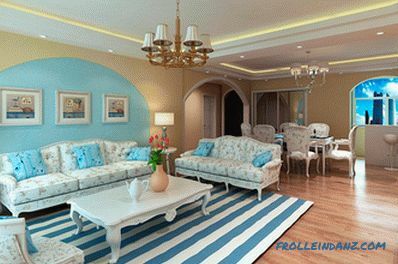 Since one of the concepts of interior design in the Mediterranean style is sunlight, you should not save on lighting fixtures. 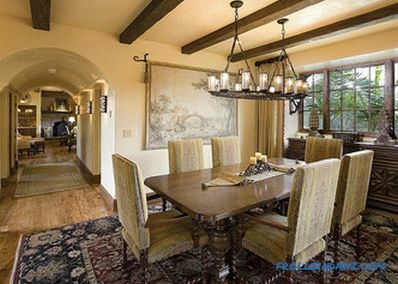 A good option - ceiling spot spots and lamps hanging from wooden beams. The number of such devices can be unlimited, which will allow you to create a simulation of daylight, even at night. Favorable look at a variety of wall and floor lamps, table lamps will not be superfluous. 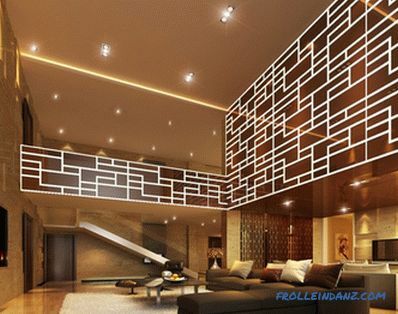 Another interesting solution - LED strip, located around the perimeter of the ceiling. In combination with standard devices they will illuminate the room well, and at night it is convenient to use such tape for a night light. 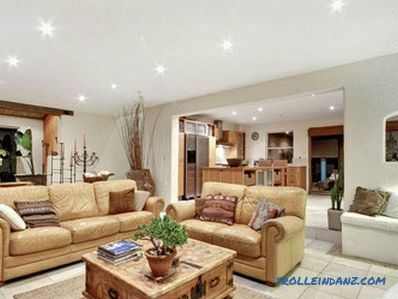 Ceiling spots, a chandelier and candles - all directed towards bright lighting. The option of lighting with LED strips. 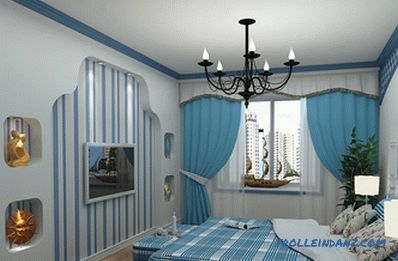 Union of wall, ceiling and table lamps. It is the elements of the decorations and decorations that create the indescribable atmosphere of the Mediterranean style in the interior. Everything the nature of this land is famous for should be reflected in the accessories. Stormy vegetation mimics a lot of pots with a variety of flowers and greens. The mood of the sea is created with the help of bright panels of stones, shells and other petrified inhabitants of the underwater depths. A characteristic feature of this trend is wide open shelves, on which there are various ceramic products, painted with floral and marine ornaments. 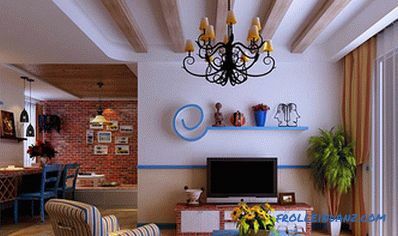 The decoration of rooms can be objects of art: decorative plates and jugs, figurine figurines and paintings, mainly with sea views and green landscapes. An interesting solution would be a combination of the traditions of the Greek-Italian direction with African or Turkish Mediterranean motifs. They will refresh this southern style and complement the overall picture with their originality. Decorative plates go well with photo frames and flowers. The painting and the stucco elements set the mood for the room. Many interesting things can be stored on the open shelves.